If you’ve followed my blog for any amount of time you know that I love the new year, as a time of personal reflection and of fresh starts. Today I’m reflecting on my 2015 crafting, looking at what I liked and what I wish I’d done differently, to help me plan for a fun and productive 2016. 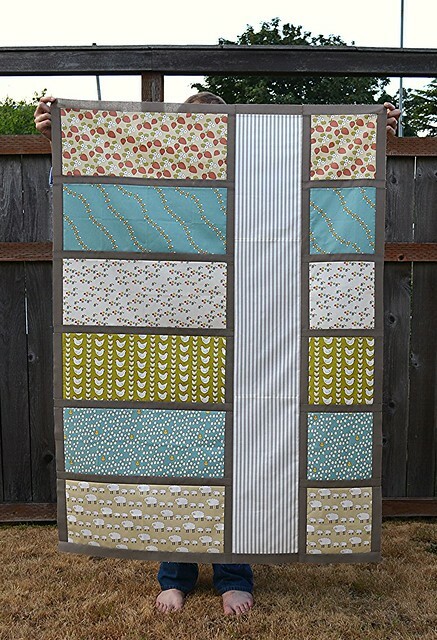 Summer seemed like the perfect time for piecing this baby quilt. Don’t tell anyone, but I clipped this sweater in the back while taking photos so that the waist would look more fitted! One project I was really proud of was finally finishing this sweater. I started it in 2012 and was never quite happy with the waist shaping or the way it fit around the hips. So after years of it sitting awkwardly in a drawer with the idea that “someday I’d fix it,” I finally frogged it up to the armpits and re-knit it. It feels really good to have fixed something that I was never really happy with, instead of either wearing it and continuing to be unhappy with it, or letting it sit around unworn. I have another sweater in a similar situation—problematic collar and button bands—and I’m sure it would feel great to fix it in 2016. I finally dismembered this sweater after 3+ years. It was pretty good (and I wore it), but the waist shaping always bothered me, and I’m finally ready to fix it. Wish me luck! Quilting-wise, my biggest accomplishment was finishing a roughly queen-sized quilt. I made it as a gift for a friend and it’s by far the most ambitious thing I’ve sewn so far. I did send it out for quilting because of its size, which I don’t regret, but it did make me think about how I’d like to get more quilting practice next year on my own machine. The baby quilt above should be manageable, and I’ve got a few placemats on the back burner that I may practice some free-motion quilting on. So what should I take away from all this? One thing is that I’d like to be more intentional about how I spend my free time. I should be able to finish more than 13 knitting projects in a year, especially if I spent less time doing forgettable things like playing solitaire. 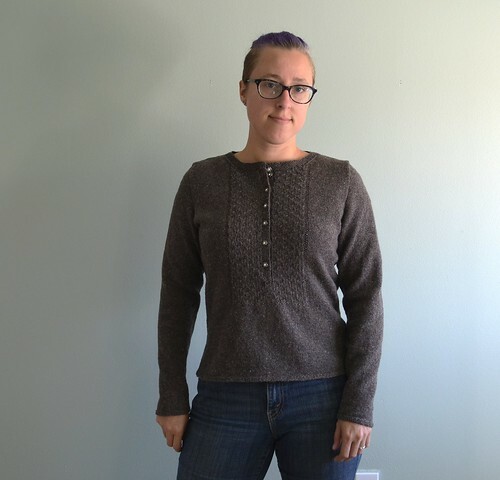 I also want to build my handmade sweater wardrobe, so I’m hoping that trying CustomFit will help in that arena; and I’ve learned that if I’m not wearing a sweater, there’s probably a reason why, and I should either fix it or learn from it. For example, I don’t wear most of my pullovers because I change temperature too much during the day (I’m constantly taking them off and on and off again), so I’m learning to only queue cardigans. Lastly, this was my first year on Instagram, and I’ve really enjoyed seeing everyone’s crafty photos and trying to be better about documenting my own projects. (The photography is still my least favorite part.) So thanks for all your likes, and for inspiring me with your work, and I can’t wait to see what y’all make in 2016! Love this post and am happy to have spent some time knitting with you in 2015. Hoping to see you at least once in the new year.